Mask: Optional. Defines the area that will be tiled. Tile Size: Default: 0.5, Range: 0 or greater. The width of an individual tile. Tile Shape: Popup menu, Default: Square . Determines the shape of the tiles. Vary Shape: Default: 0.2, Range: 0 to 1. Controls the variation of the tile shape. Set to 0 for regularly shaped tiles. Set to 1 for randomly shaped tiles. Tile Edge Sharpness: Default: 0.9, Range: 0 to 1. How sharp to make the 3d lighting roll off on the edge of the tile. Set to 1 for a very sharp tile edge. Set to a lower number for a softer, more curved tile. Tile Texture Freq: Default: 50, Range: 0 or greater. The frequency controls how coarse or fine the bumpy texture on the tiles is. Tile Roughness: Default: 0.75, Range: 0 to 1. The height of the bumpy texture on the tiles. Tile Height: Default: 0.5, Range: 0 or greater. The strength of the lighting on the edge of the tiles. Tile Opacity: Default: 0.9, Range: 0 to 1. The opacity of the tiles. Set to 0 to show the source. Set to 1 to show only the tile. Cracked Tiles: Default: 0, Range: 0 to 1. 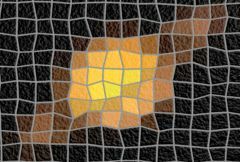 How likely a tile is to crack along edges in the source. Set to 0 to get no cracked tiles. Set to 1 to see tiles with detectable edges crack. At .5 only tiles with strong edges will crack. Tiles with a very slow gradient will never crack. Smooth Colors: Default: 0.2, Range: 0 or greater. Control the variation in the color palette. Increase to make only very sharp image edges change tile colors. Edge Attract: Default: 0.2, Range: 0 to 1. How strongly the corners of the tiles should attract to the edges in the image. Grout Color: Default rgb: [0.4 0.4 0.4]. The color of the grout between the tiles. Grout Width: Default: 0.1, Range: 0 to 1. The width of the grout between the tiles as a percentage of the tile size. Grout Texture Freq: Default: 150, Range: 0 or greater. The frequency controls how coarse or fine the bumpy texture in the grout is. Grout Roughness: Default: 0.5, Range: 0 to 1. The height of the bumpy texture in the grout. Grout Opacity: Default: 1, Range: 0 to 1. The opacity of the grout between the tiles. Set to 0 to show the source. Set to 1 to show only the grout. Light Position: X & Y, Default: screen lower left. The XY position of the light. This parameter can be adjusted using the Light Position Widget. The tiles are lit with a 3d point light source. This param sets the brightness of that light. Set to 0 to disable the light. Increase value to increase the intensity of the light. Light Color: Default rgb: [0.5 0.5 0.5]. Light Z: Default: 5, Range: 1 or greater. The height of the light source. Crop To Alpha: Check-box, Default: off. Crop the tiles to the source alpha. If a mask input is provided, the mosaic will be cropped to the mask as well. When turned off, tiles generated inside the opaque region of the image might stick out into the transparent regions. When turned on, the tiles themselves will be cropped at the edge of the opaque region. Bg Brightness: Default: 1, Range: 0 to 1. Scales the brightness of the background before combining with the romans. If 0, the result will contain only the roman image over black. Mask Use: Popup menu, Default: Alpha .